Patients with pancreatic cancer (pancreatic ductal adenocarcinoma [PDAC]) commonly develop abdominal pain that can be debilitating. Celiac plexus neurolysis (CPN) is a chemical ablation of the celiac plexus that can be used to treat pain caused by PDAC. Celiac plexus intervention for pancreatic pain was first described by Kappis in 1914. The initial approach utilized for injection was posterior and percutaneous, which can nowadays also be performed under fluoroscopic or computed tomography (CT) guidance. A modified anterior approach can be performed under guidance of transabdominal ultrasound, CT, intra-operatively or most recently under linear endoscopic ultrasound (EUS) guidance (EUS-CPN). EUS is well-suited for identification of the celiac plexus due to the close approximation of the gastric wall with the origin of the celiac artery [Figure 1]. Endoscopic ultrasound-CPN was first described by Wiersema and Wiersema. in 1996, in a series of 30 patients with intra-abdominal malignancy treated with injection of bupivacaine and 98% absolute alcohol. Patients in this study reported significant improved pain scores at 12 weeks after the procedure. Since its first description, different EUS approaches have been developed in order to improve the efficacy of EUS-CPN. EUS-CPN is now widely practiced and current National Comprehensive Cancer Network guidelines (version 1.2014) for pancreatic adenocarcinoma, recommend EUS-CPN for the treatment of a severe tumor-associated pain. In this review, we discuss EUS-CPN in PDAC from endosonographers perspective, focusing on efficacy, complications, different EUS approaches, as well as novel techniques. Celiac plexus neurolysis refers to permanent ablation of the celiac plexus. It is usually performed by injection of phenol or alcohol in a patient with malignant disease such as PDAC. Celiac plexus block, on the other hand, denotes temporal inhibition of pain transmission via the celiac plexus. It is most commonly performed with injection of corticosteroid and long acting local anesthetic in a patient with chronic pancreatitis. Recent reports have documented accurate identification of celiac ganglia in 62-88% of patients with pancreatic cancer and 81-88% of unselected patients. ,,, Therefore, researchers have evaluated whether efficacy of CPN can be improved by direct ganglia injection  (celiac ganglia neurolysis [CGN]). During EUS-CGN, direct ganglia injection is performed into as many visualized ganglia as possible. For a ganglion smaller than 1 cm, the needle tip is positioned within the central point of ganglia. For ganglia 1 cm or larger, the needle tip is typically advanced to the deepest point within the ganglia relative to the echoendoscope and the injectate is slowly administered while the needle is withdrawn within the ganglion. Endosonographers with competency with EUS and EUS-FNA technique should be allowed to perform EUS-CPN. We do not believe this technique should be limited to referral centers. Endoscopic ultrasound can identify celiac ganglia in 62-89% of patients; in 62-88% of patients with pancreatic cancer and 81-88% of unselected patients. ,,, In our experience, celiac ganglia can be visualized in approximately 70% of subjects. Rate of ganglia detection appears to vary among endosonographers, and an earlier study suggest ganglia are best visualized with the curvilinear scope. ,,, Interest has developed in direct celiac ganglia injection (CGN) to improve the efficacy of CPN [Figure 2]. Levy et al. retrospectively reported results of CGN in 33 patients, including 18 patients with PDAC  and found that 94% of patients reported pain relief at weeks 2-4. In addition, initial pain exacerbation occurred in 34% of patients and correlated with better pain relief. In a recent randomized, multicenter controlled trial including 68 patients with upper abdominal cancer pain (90% PDAC), celiac ganglion neurolysis was more effective than CPN in relieving pain (73.5% vs. 45.5%, respectively; P = 0.02). Despite the superiority of EUS-CGN over CPN in achieving pain control, in patients with advanced malignancy in which ganglia cannot be visualized we still believe celiac neurolysis should be performed, given overall safety of procedure and effectiveness in pain relief provided by neurolysis. As observed by Wiersema and Wiersema during the initial description of EUS-CPN, injection of alcohol produces objective evidence of discomfort despite moderate sedation. Since then, anesthetic is employed prior to alcohol injection to minimize this effect. The type, dose and concentration of anesthetic used during EUS-CPN is not standardized. In most studies, bupivacaine was used in a concentration ranging between 25% and 75% and in a dose ranging between 3 and 20 ml. ,,,,,, Other studies have used lidocaine 1%, dose ranging from 3 to 10 ml. , Currently, there are no studies accessing effectiveness of different anesthetics or dosage. In addition, it is unclear if when neurolysis is being performed with anesthesiologist support the use of anesthetic is needed. It is, however, our current practice to use as we perform CGN whenever feasible, which can be associated with exacerbation of pain shortly after the procedure. A variety of commercially available FNA needles is currently available which range in size from 19 to 25-gauge. Most endosonographers perform CPN with standard 22-gauge FNA needles which are widely availability and easy to use. This needle, however, may require slow, forceful injection to disseminate the alcohol during CPN. A 20-gauge needle specifically designed for EUS-guided celiac plexus interventions (EchoTip celiac plexus needle; Cook Medical, Winston-Salem NC; USA) differs from other EUS needles in that it does not have a removable stylet. Rather, this device has a solid, sharp, conical tip, and an array of side holes for radial delivery of the desired agent into the celiac plexus and/or the perineural space. This "spray" needle provides easy and quick injection, with multidirectional delivery of the agent in the celiac area, however echogenic "blush" is not seen at the time of injection. Furthermore, this needle is not available in some countries. A 19-gauge needle offers little if any resistance to injection however transgastric puncture can be difficult in some patients. At present, there are no studies specifically comparing various needle types or sizes in CPN. Patient survival can in times exceed the benefit of CPN, and therefore occasionally repeat CPN may be considered. In a retrospective study including 24 patients with PDAC in which repeat percutaneously guided neurolysis was performed, the success rate decreased from 67% after initial CPN to 29% following repeat CPN (P = 0.13) with an associated decrease in mean duration of pain relief from 3.4 months for initial CPN to 1.6 months of repeat CPN (P = 0.03). In a recent retrospective study by our group,  including 50 patients with PDAC in which repeat EUS- CPN was performed, the mean number of EUS-CPN was 2.2. The mean duration of pain relief after the first CPN was 13 weeks and after the second CPN 8 weeks. Response to the first CPN was associated with response to the second CPN (P < 0.0001). Surprisingly direct ganglia injection was not associated with the pain response. Repeat EUS-CPN was safe, only one minor complication occurred after the first CPN (postprocedural abdominal pain) and there was no major complications reported-up to the forth CPN. Prospective studies are needed to further confirm the safety and determine efficacy of repeat EUS-CPN. Sakamoto et al. presented a single-center study comparing the pain-relieving effectiveness of standard EUS-CPN with EUS-guided broad plexus neurolysis (EUS-BPN) in 67 patients with advanced abdominal cancer (89% of those PDAC). EUS-BPN uses 25-gauge needle to inject both sides of the SMA. Postprocedure CT was used to assess the spread of the neurolytic agent (mixed with contrast) around the celiac, superior and inferior mesenteric areas and evaluate the relationship between pain relief and the number of contrast-bearing areas. The EUS-BPN group had more patients with six contrast-bearing areas (42%) than the EUS-CPN group (0%). These patients had significantly better short-term and long-lasting pain relief than patients with <5 contrast-bearing areas. EUS-BPN patients exhibited significantly greater reductions in days 7 and 30 visual analog pain scale scores than EUS-CPN patients. Although those results are promising, those results should be interpreted with caution as this study was retrospective and nonrandomized. Further studies are needed to better determine the efficacy of this new approach. Brachytherapy involves the insertion of a radioactive seed directly into a pancreatic tumor for localized therapy. The most common radioactive seed used clinically is iodine-125, which has a half-time of 59.7 days and tissue penetration of 1.7 cm. Currently, in the three series reporting brachytherapy with EUS implanted seeds in advanced PDAC, no significant survival benefit occurred, however pain scores were significantly reduced. ,, In the most recent and largest series  of 100 patients with advanced PDAC undergoing brachytherapy with EUS implanted seeds, pain scores dropped dramatically after 1-week postimplantation, with sustained results until the 3 rd month. The same group then reported the use of iodine-125 as a neurolytic agent in 23 patients undergoing EUS-guided CGN for unresectable PDAC. The mean number of seeds implanted in the celiac ganglion was 4 (range: 2-6). Immediately after the procedure, pain relief and analgesic consumption showed no significant changes compared to pre-CGN values and 26% of patients reported pain exacerbation. However, at week 2, 82% of patients had a reduction in pain score on a VAS, and the mean narcotic consumption had decreased. This effect lasted until the study conclusion at 5 months follow-up when only two patients were still alive. No major complications occurred. The authors postulate that iodine-125 may be a superior neurolytic agent compared with ethanol due to its longer half-life and deeper tissue penetration, although this has yet to be confirmed in controlled clinical trial. Larger studies are needed to further evaluate this technique, including assessment of patient safety studies as well as safety of handling and storing radioactive material at endoscopy suites. Patients with PDAC are most commonly seen by gastroenterologists only at the time of initial diagnosis for biopsy or stenting. If a PDAC is an unresectable tumor and pain affecting QOL or requiring narcotics (usually body and tail cancers) at the time of presentation then, EUS-CPN should be offered simultaneously with the planned EUS-FNA, and this is our current practice. In a study by Ascunce et al., tumors located outside the head of the pancreas and patients with higher baseline pain level were associated with a good response. Patients who fail medical management should not be the only ones considered. Earlier therapy may be better than waiting for medical failure. In a study by Wyse et al., early EUS-CPN at the time of EUS-FNA reduced pain in patients with inoperable PDAC. Patients with resectable tumors usually do not have pain, so these are less likely to be candidates for EUS-CPN at the time of diagnostic EUS. Patients should be offered repeat CPN if it initially aids but the pain the effect wears off, although evidence is limited. , These repeat referrals are usually directed by the oncologist or surgeon. Endoscopic ultrasound permits real-time visualization and utilizes an anterior approach for CPN, which allows more precise needle placement and avoidance of intervening structures. Since first description of EUS-CPN, investigators have employed several technical variations in terms of target of injection, composition and volume of the injectate. Until date, targeted injection at the visualized celiac ganglia has been shown to be the best predictor of pain response in EUS-CPN. Further prospective studies are needed to evaluate the clinical utility of different approaches for EUS-CPN. 1. Kappis M. Erfahrungen mit local anasthesie bie bauchoperationen. Vehr Dtsch Gesellsch Chir 1914;43:87-9. 2. Wiersema MJ, Wiersema LM. Endosonography-guided celiac plexus neurolysis. Gastrointest Endosc 1996;44:656-62. 3. NCCN guidelines. 2014 for Pancreatic Adenocarcinoma. Available from: http://www.nccn.org/professionals/physician_gls/pdf/pancreatic.pdf. [Last accessed on 2014 February]. 4. Soweid AM, Azar C. Endoscopic ultrasound-guided celiac plexus neurolysis. World J Gastrointest Endosc 2010;2:228-31. 5. Ward EM, Rorie DK, Nauss LA, et al. The celiac ganglia in man: Normal anatomic variations. Anesth Analg 1979;58:461-5. 6. Penman ID, Gilbert D. Basic technique for celiac plexus block/neurolysis. Gastrointest Endosc 2009;69:S163-5. 7. Brown DL, Moore DC. The use of neurolytic celiac plexus block for pancreatic cancer: Anatomy and technique. J Pain Symptom Manage 1988;3:206-9. 8. Ascunce G, Ribeiro A, Reis I, et al. EUS visualization and direct celiac ganglia neurolysis predicts better pain relief in patients with pancreatic malignancy (with video). Gastrointest Endosc 2011;73:267-74. 9. Doi S, Yasuda I, Kawakami H, et al. Endoscopic ultrasound-guided celiac ganglia neurolysis vs. celiac plexus neurolysis: A randomized multicenter trial. Endoscopy 2013;45:362-9. 10. Gleeson FC, Levy MJ, Papachristou GI, et al. Frequency of visualization of presumed celiac ganglia by endoscopic ultrasound. Endoscopy 2007;39:620-4. 11. Ha TI, Kim GH, Kang DH, et al. Detection of celiac ganglia with radial scanning endoscopic ultrasonography. Korean J Intern Med 2008;23:5-8. 12. Levy MJ, Topazian MD, Wiersema MJ, et al. Initial evaluation of the efficacy and safety of endoscopic ultrasound-guided direct Ganglia neurolysis and block. Am J Gastroenterol 2008;103:98-103. 13. Gunaratnam NT, Sarma AV, Norton ID, et al. A prospective study of EUS-guided celiac plexus neurolysis for pancreatic cancer pain. Gastrointest Endosc 2001;54:316-24. 14. Puli SR, Reddy JB, Bechtold ML, et al. EUS-guided celiac plexus neurolysis for pain due to chronic pancreatitis or pancreatic cancer pain: A meta-analysis and systematic review. Dig Dis Sci 2009;54:2330-7. 15. Yan BM, Myers RP. Neurolytic celiac plexus block for pain control in unresectable pancreatic cancer. Am J Gastroenterol 2007;102:430-8. 16. Arcidiacono PG, Calori G, Carrara S, McNicol ED, Testoni PA. Celiac plexus block for pancreatic cancer pain in adults. Cochrane Database Syst Rev 2011;16:CD007519. 17. Kaufman M, Singh G, Das S, et al. Efficacy of endoscopic ultrasound-guided celiac plexus block and celiac plexus neurolysis for managing abdominal pain associated with chronic pancreatitis and pancreatic cancer. J Clin Gastroenterol 2010;44:127-34. 18. Nagels W, Pease N, Bekkering G, et al. Celiac plexus neurolysis for abdominal cancer pain: A systematic review. Pain Med 2013;14:1140-63. 19. Wallace MB, Woodward TA, Hoffman BJ, et al. A prospective double blind randomized controlled trial of EUS guided celiac neurolysis vs. sham for pancreatic cancer pain. Gastrointest Endosc 2010;71:AB224. 20. Wyse JM, Carone M, Paquin SC, et al. Randomized, double-blind, controlled trial of early endoscopic ultrasound-guided celiac plexus neurolysis to prevent pain progression in patients with newly diagnosed, painful, inoperable pancreatic cancer. J Clin Oncol 2011;29:3541-6. 21. O'Toole TM, Schmulewitz N. Complication rates of EUS-guided celiac plexus blockade and neurolysis: Results of a large case series. Endoscopy 2009;41:593-7. 22. Alvarez-Sánchez MV, Jenssen C, Faiss S, et al. Interventional endoscopic ultrasonography: An overview of safety and complications. Surg Endosc 2014;28:712-34. 23. Iwata K, Yasuda I, Enya M, et al. Predictive factors for pain relief after endoscopic ultrasound-guided celiac plexus neurolysis. Dig Endosc 2011;23:140-5. 24. Sahai AV, Lemelin V, Lam E, et al. Central vs. bilateral endoscopic ultrasound-guided celiac plexus block or neurolysis: A comparative study of short-term effectiveness. Am J Gastroenterol 2009;104:326-9. 25. Loeve US, Mortensen MB. 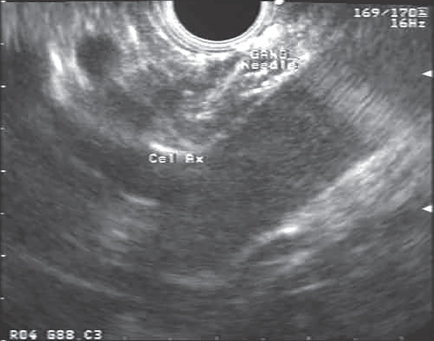 Lethal necrosis and perforation of the stomach and the aorta after multiple EUS-guided celiac plexus neurolysis procedures in a patient with chronic pancreatitis. Gastrointest Endosc 2013;77:151-2. 26. Gimeno-García AZ, Elwassief A, Paquin SC, et al. Fatal complication after endoscopic ultrasound-guided celiac plexus neurolysis. Endoscopy 2012;44 Suppl 2 UCTN:E267. 27. Jang HY, Cha SW, Lee BH, et al. Hepatic and splenic infarction and bowel ischemia following endoscopic ultrasound-guided celiac plexus neurolysis. Clin Endosc 2013;46:306-9. 28. Fujii L, Clain JE, Morris JM, et al. Anterior spinal cord infarction with permanent paralysis following endoscopic ultrasound celiac plexus neurolysis. Endoscopy 2012;44 Suppl 2 UCTN:E265-6. 29. Mittal MK, Rabinstein AA, Wijdicks EF. Pearls & oy-sters: Acute spinal cord infarction following endoscopic ultrasound-guided celiac plexus neurolysis. Neurology 2012;78:e57-9. 30. Gress F, Schmitt C, Sherman S, et al. A prospective randomized comparison of endoscopic ultrasound- and computed tomography-guided celiac plexus block for managing chronic pancreatitis pain. Am J Gastroenterol 1999;94:900-5. 31. Muscatiello N, Panella C, Pietrini L, et al. Complication of endoscopic ultrasound-guided celiac plexus neurolysis. Endoscopy 2006;38:858. 32. Mahajan R, Nowell W, Theerathorn P. Empyema after endoscopic ultrasound-guided celiac plexus (EUS-CPB) in chronic pancreatitis (CP): Experience at an academic center. Gastrointest Endosc 2002;55:AB101. 33. Lalueza A, Lopez-Medrano F, del Palacio A, et al. Cladosporium macrocarpum brain abscess after endoscopic ultrasound-guided celiac plexus block. Endoscopy 2011;43 Suppl 2 UCTN:E9-10. 34. Penman ID, Rösch T, EUS 2008 Working Group. EUS 2008 Working Group document: Evaluation of EUS-guided celiac plexus neurolysis/block (with video). Gastrointest Endosc 2009;69:S28-31. 35. 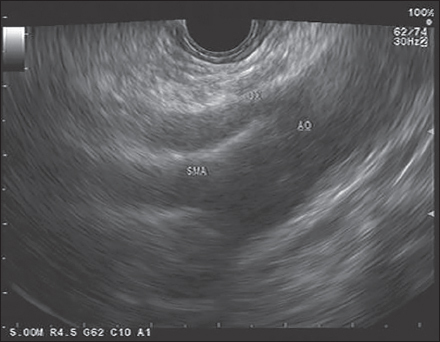 Seicean A. Celiac plexus neurolysis in pancreatic cancer: The endoscopic ultrasound approach. World J Gastroenterol 2014;20:110-7. 36. LeBlanc JK, Al-Haddad M, McHenry L, et al. A prospective, randomized study of EUS-guided celiac plexus neurolysis for pancreatic cancer: One injection or two? Gastrointest Endosc 2011;74:1300-7. 37. Leblanc JK, Rawl S, Juan M, et al. endoscopic ultrasound-guided celiac plexus neurolysis in pancreatic cancer: A prospective pilot study of safety using 10 mL versus 20 mL Alcohol. Diagn Ther Endosc 2013;2013:327036. 38. Sakamoto H, Kitano M, Kamata K, et al. EUS-guided broad plexus neurolysis over the superior mesenteric artery using a 25-gauge needle. Am J Gastroenterol 2010;105:2599-606. 39. Harada N, Wiersema MJ, Wiersema LM. Endosonography-guided celiac plexus neurolysis. Gastrointest Endosc Clin N Am 1997;7:237-45. 40. Adler DG, Conway JD, Coffie JM, et al. EUS accessories. Gastrointest Endosc 2007;66:1076-81. 41. McGreevy K, Hurley RW, Erdek MA, et al. The effectiveness of repeat celiac plexus neurolysis for pancreatic cancer: A pilot study. Pain Pract 2013;13:89-95. 42. Sey MA, Dewitt JM, Leblanc JK. Repeat endoscopic ultrasound-guided celiac plexus block and neurolysis: What is the efficacy and safety? Am J Gastroenterol 2013;108:s572-620. 43. Virtue MA, Levy MJ. Editorial: Neurolysis for pancreatic cancer pain: Same song, different verse? Am J Gastroenterol 2010;105:2607-9. 44. Jin Z, Chang KJ. Endoscopic ultrasound-guided fiducial markers and brachytherapy. Gastrointest Endosc Clin N Am 2012;22:325-31, x. 45. Jin Z, Du Y, Li Z, et al. Endoscopic ultrasonography-guided interstitial implantation of iodine 125-seeds combined with chemotherapy in the treatment of unresectable pancreatic carcinoma: A prospective pilot study. Endoscopy 2008;40:314-20. 46. Du Y, Jin Z, Meng H, et al. Long-term effect of gemcitabine-combined endoscopic ultrasonography-guided brachytherapy in pancreatic cancer. J Interv Gastroenterol 2013;3:18-24. 47. Sun S, Xu H, Xin J, et al. Endoscopic ultrasound-guided interstitial brachytherapy of unresectable pancreatic cancer: Results of a pilot trial. Endoscopy 2006;38:399-403. 48. Wang KX, Jin ZD, Du YQ, et al. EUS-guided celiac ganglion irradiation with iodine-125 seeds for pain control in pancreatic carcinoma: A prospective pilot study. Gastrointest Endosc 2012;76:945-52.